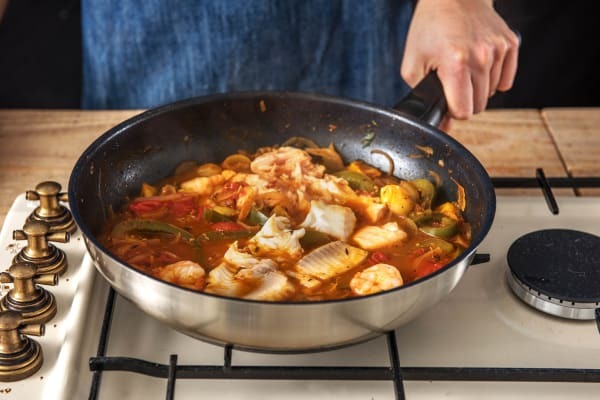 Fresh, zesty and wholesome, our Mediterranean-inspired fish stew is the perfect one-pot recipe for any night of the week. In this dish, our delicious seafood mix is gently combined in a rich vegetable packed stew and steamed until cooked through. 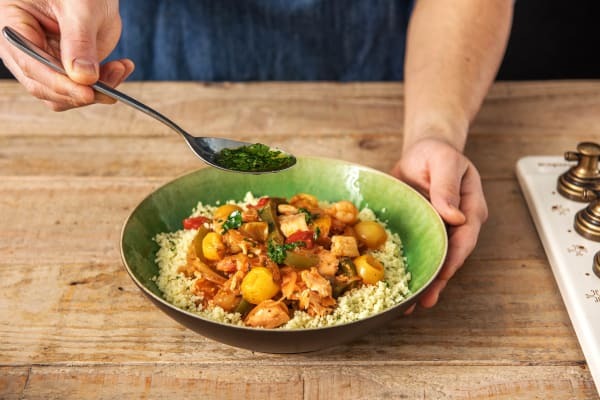 We’ve served this delicious stew with a simple couscous salad and finished everything off with a delicious parsley dressing for a real taste of the Mediterranean. Halve, peel and thinly slice the onion. 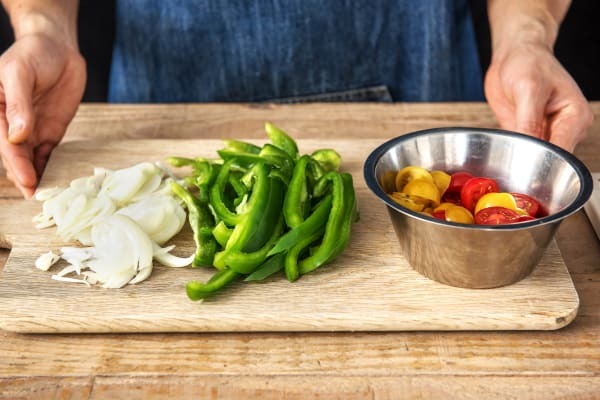 Halve the green pepper and remove the core and seeds. Slice into thin strips. Halve the cherry plum tomatoes. Peel and grate the garlic (or use a garlic press). Roughly chop the parsley (stalks and all). Heat a good glug of oil in a large saucepan over medium heat. 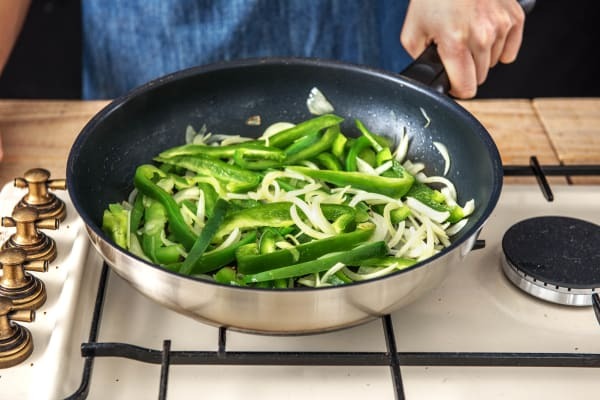 Pop the onion and pepper into the pan. Mix well then leave to cook until beginning to colour and soften, stirring occasionally, 5-7 mins. Once soft, stir in the garlic, Italian style herbs, tomato purée and a pinch of chilli flakes to taste (careful, they're hot!). Stir, then cook for 1 more minute. 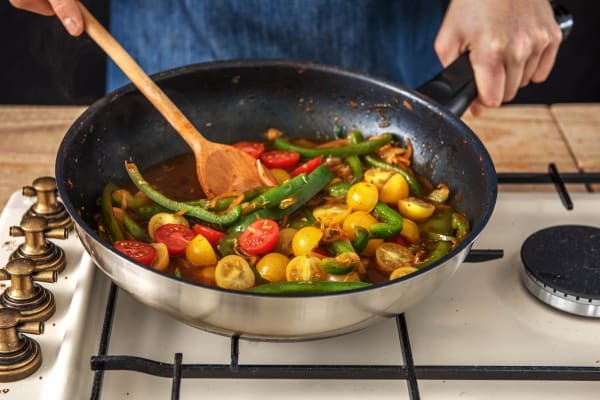 Pop the tomatoes into the pan along with the water for the stew (see ingredients for amount), a pinch of sugar (if you have some) and a pinch of salt and pepper to taste. Bring to the boil, then lower the heat, cover with a lid and gently simmer for 25-30 mins, until the tomatoes have broken down and the sauce has thickened slightly. Stir occasionally. Fill and boil your kettle. In the meantime, put the couscous, one- quarter of the chopped parsley and the stock powder in a mixing bowl. 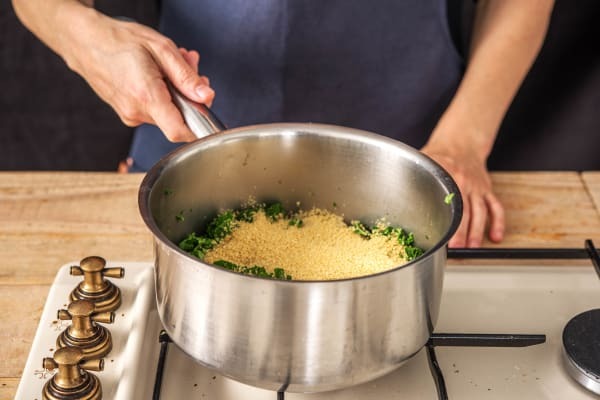 From your kettle pour the boiling water for the couscous (see ingredients for amount) into the bowl, stir to dissolve the stock powder, then cover tightly with clingfilm and leave to the side for 10 mins or until ready to serve. Put the remaining parsley into a small bowl and stir in the olive oil (see ingredients for amount), season with a pinch of salt and a good grind of pepper. Set aside. When the stew has about 5 mins left, gently stir in the fish pie mix. Return the lid to the pan and continue to simmer for 4-5 mins until the fish is cooked. IMPORTANT: The fish is cooked when opaque in the middle. Once the fish is cooked taste and add more salt and pepper if required. 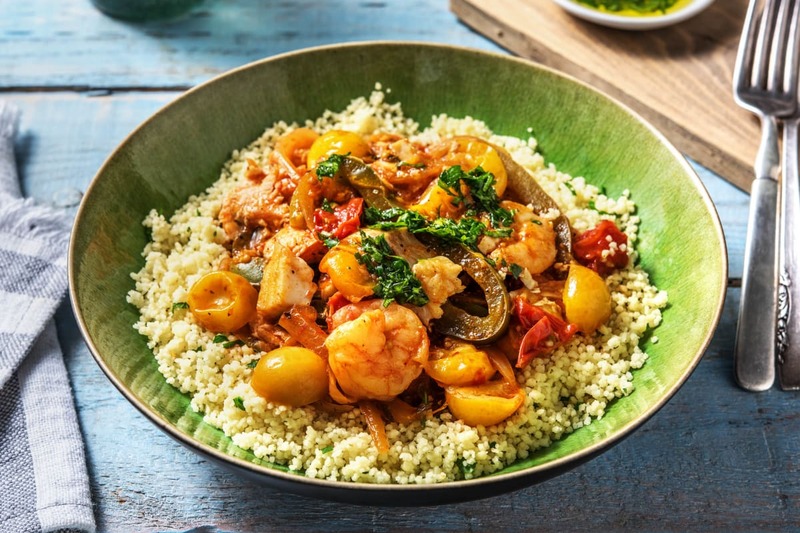 Fluff up the couscous with a fork, then divide between bowls with the fish stew spooned over. Finish with a drizzle ofr the parsley oil. Tuck in!